It’s no secret, Samsung has been crawling under Apple’s skin for quite some time. Now, with the release of the Samsung Galaxy S III, Samsung wants iPhone users to know they can make the switch effortlessly thanks to a free app they’re making available to UK Galaxy devices. The app is called Easy Phone Sync, from developer Media Mushroom, and promises to makes transferring your iOS content over to your new Galaxy device a breeze. The application consists of two parts: One part runs on your Samsung Galaxy device, the other on your PC or Mac. Another bold taunt from a company who insists on lighting fires under the belly of the beast. From what I hear, it works pretty well, so if you’re deciding, or have already decided to make the switch, give the free app a try. 22nd June 2012, London, UK – Samsung Mobile UK today announced it will be making Easy Phone Sync available for free to anyone purchasing a Samsung Galaxy device. Easy Phone Sync is a simple new way for people to transfer their iPhone and iTunes media – including music, videos, podcasts, pictures, contacts and text messages – to a Samsung Galaxy device including the new Galaxy S III. As part of an exclusive licensing agreement with Media Mushroom Applications, Samsung is making Easy Phone Sync available for free for UK customers to transfer content from their iOS device to their Samsung Galaxy device in a few simple clicks. As well as being able to access DRM free content they have purchased from iTunes music, customers can continue to use iTunes software on their PC to manage their music, videos and podcasts and keep their Android device in sync with it. 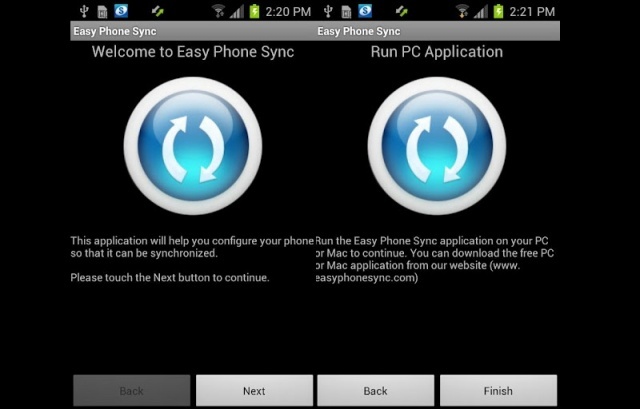 Easy Phone Sync is available to download now for both PCs and Macs in conjunction with an app for Samsung Android devices. For more detailed information, please visit www.easyphonesync.com/mobile.